Today’s data centers are being asked to do more at less expense and with little or no disruption to company operations. They’re also expected to run 24x7, handle numerous new application deployments and manage explosive data growth. Data storage limitations can make it difficult to meet these stringent demands. 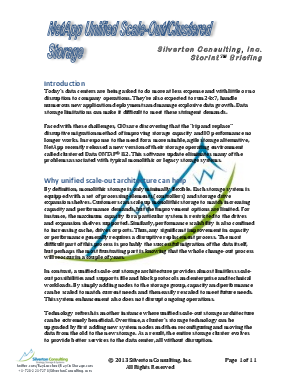 Faced with these challenges, CIOs are discovering that the “rip and replace” disruptive migration method of improving storage capacity and IO performance no longer works. Access this white paper to discover a new version of NetApps storage operating environment. Find out how this software update eliminates many of the problems associated with typical monolithic or legacy storage systems.